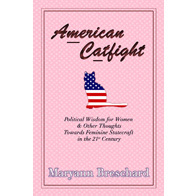 I won’t go into restating the whole argument as that is what actually reading American Catfight is for but will note that one need only look at the new war on women’s rights to see that we’ve got a collapse of feminism’s complex system on our hands. Feminist systems have become so complex and bureaucratic in leadership that whatever systems we’ve put in place – NOW, Women’s Studies, Emily’s List, whatever – have failed to the point that the American public is debating access to birth control. Again. Forty-seven years after Griswold v. Connecticut. I know the word “catfight” can be incendiary. But I use it purposefully as a word to describe the feminist equivalent of women on women fighting akin to what goes on when people fight about what is “not black enough” in the African American community. Both are groups that should be united in what they share but instead at times fall into envy and righteousness and fracture themselves over differences that no one outside their groups even sees. But I get where you are coming from. I have thought many times, “Why do they have to call it “Slutwalk? !”” As a writer, you understand better than most that we bend and stretch language to try to find new meanings in it or expand the ones we have. Sometimes the new meaning takes off and sometimes it dies in the nest but we try. So that’s what I mean by ‘catfight.’ Now I’ve got to get back to writing my new (feminist) science fantasy book because while I am a feminist, I must take my own advice and not tie my entire livelihood to it.